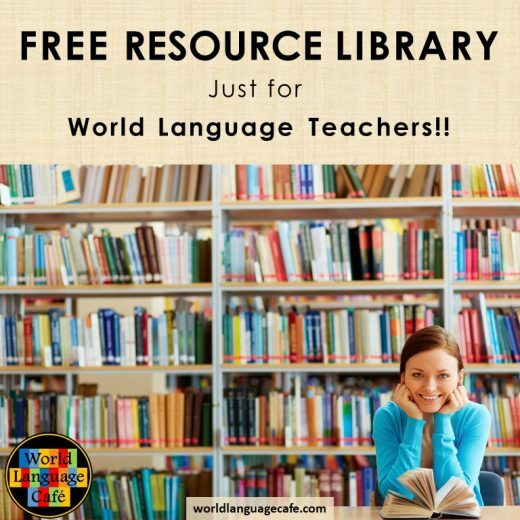 Hopefully, by now you have read the first part in this series which gives you some pointers and teaches you some of the habits that you’ll need to change to be successful in getting your students to speak in the target language. If not, take a sec. to check it out here. And now for the good stuff . . . 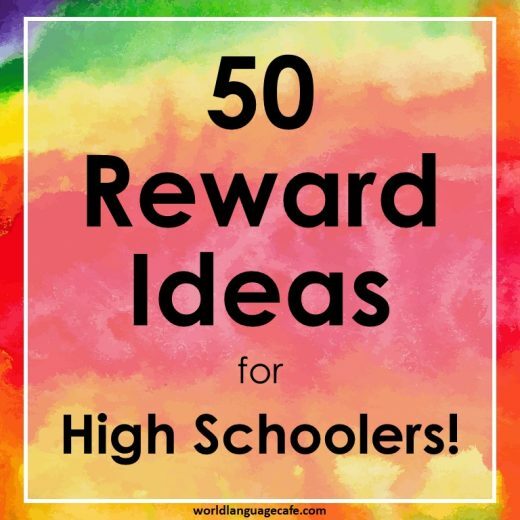 Some of these strategies are my own, but most, I have collected from other World Language teachers who were kind enough to share their best tips. Write a word on the board at the beginning of the period. Any time you hear ANY English, erase a point. If the class has any letters left over at the end of the period, they each get an extra point on the next test. As they get better, they must keep the word up for a few days or a week. See Angie Torre from Best Power Points for Spanish’s blog post explaining more. Mime Method: Mime what you are saying. Signaling: Point to what you are talking about. Use Gestures: Whenever you’re teaching songs, teach gestures for the key words before starting and have the students practice them. Say the word and have them do the gesture. Then they do the gestures along with the song. Draw: Draw a picture of what you’re talking about. Use Photos: Print out pictures or photos to illustrate concepts. Tape the target language word or phrase on the photograph. Student Vocabulary: Assign each student a vocabulary word or phrase and have them make a meme to illustrate its meaning. Find a picture online to represent the concept and then add a text box on top with the words. Post Your Instructions Visually: If you’re an elementary school teacher, you might like this blog post from about staying 90% in the target language. In it, Julie from Mundo de Pepita suggests posting your instructions visually. For older students, Angie Torre also suggests using a PowerPoint showing the key language that you are using in the target language. When we watch a movie in another language, it’s so much easier to understand if we can read the words while we listen to them. Do this in your class, too. Put key phrases on bulletin boards or on your white board for the day. The Págame System: TPRS guru, Blaine Ray, suggests using a “Págame”. Students start with 100 points each quarter and if they aren’t actively engaged in the target language and participating, the teacher says the student’s name and “Págame” (ex. Luis, págame.). Then the teacher makes a mark next to the student’s name on a list at the front of the class. Students can make up págame’s by writing in the target language. Read more about Blaine Ray’s, (the TPRS guru), Págame System on p. 17 and 18 of this link. Safe English Space: Create a space or time when students can speak to you in English if necessary. Mine was always outside my doorway in the hall before or after class or in my department center (although I always would start speaking the target language and they would need to request to speak in English). The Ticket System: Appoint one student in the group to be the “ticket taker” if they hear English. The winner of the next round gets to be the new “ticket taker.” Get free euro tickets and read more about how Elisabeth Edwards Alvarado from Spanish Mama uses this system here. Pass the Piñata: Have a large object (ex. a piñata) that gets passed to anyone who speaks English. If the person with the piñata hears anyone else speaking English, they can give it to that person. Whoever has the piñata at the end of class gets a small punishment (an extra sheet of homework, has to pick up anything on the classroom floor, etc.) Spanish Mama says there are a few drawbacks: Great in theory, and for specific discussion times, but she usually only remembered it because the students said, “Profe, la piñata! because they wanted to get an unlucky friend in trouble. Teach Circumlocution: Joshua Cabral from World Language Classroom emphasizes the importance of teaching his students circumlocution. Here are some of his suggestions that you may wish to post in your classroom: Use vocabulary that you already know. Try to think of another way to convey the message. Describe the concept. Explain who uses it, why it’s used, or where. Use a synonym. Use a more general category word (fruit, clothing, etc.) Explain what the object is and object is not. Check out Joshua’s circumlocution resources and a recap of one of his periscopes about using the target language here. Magic Tissue Box: Create activities that have set pieces that only use the target language. uses a “magic tissue box” and puts questions in the target language inside. The students take turns pulling out a question, sneezing (class responds in the target language to the sneeze (Salud, À tes souhaits, etc), and then the person answers the question. Another person picks a tissue and so on. ~Carolina Goméz from Fun for Spanish Teachers (Read more about it in her blog post). Speaking Rocks: Use decorative pebbles (the kind you find in flower vases) to encourage speaking in the target language. Each student takes 2 rocks when they come into class and must have 5 when they leave class. They earn extra pebbles by participating in the target language. She takes away a pebble when they speak English (without any other verbal reminder). And get this – her students loved it and asked for it the next day!!! ~Holly from Spanish Sundries (Read more here). Wow! So many ideas from amazing veteran World Language teachers. Try some over the coming weeks to see which ones work best for you. You may want to read this next part to prepare for when everything doesn’t run quite so smoothly (because we all know there are days like that). See you in the Teachers’ Lounge soon!